If you a seeking a show stopper...this is it! Beautiful wood floors! Granite counters! 19x18 downstairs master bedroom with views of the very private backyard! Spa like bath! 4 huge bedrooms with huge walk in closets and 2 extra large baths are upstairs! 2 dining areas, 2 living areas or use one for an office! 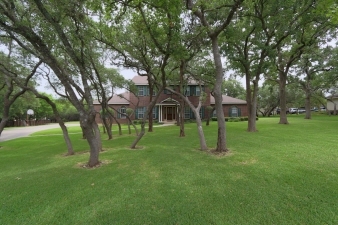 Nestled behind the majestic oaks sits this beautiful brick traditional home on almost an acre! Backyard entertainers paradise with oversized rear patio & views of the shady and private yard! Side entry 3 car garage plus workshop! Beautifully maintained and updated estate on almost an acre hidden behind majestic oaks! Easy access to 281 and 1604! Fantastic schools and neighborhood park with fishing and a gym!